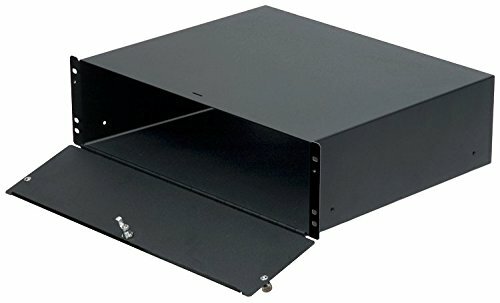 RackSolutions 3U Lockable Rackmount Box by RACKSOLUTIONS at Riot Recordings. MPN: 3UBOX-161. Hurry! Limited time offer. Offer valid only while supplies last. The Lockable Rackmount Box is ideal for securing and storing all the stuff that you would usually sit on top of some equipment in the Server Rack. The Lockable Rackmount Box is ideal for securing and storing all the stuff that you would usually sit on top of some equipment in the Server Rack. The Lockable Rackmount Box is available in three different sizes ranging from 2U to 4U. There are also additional models available with an open front for items that do not need to be secured. The lockable models can be used to store various items such as small laptops. A Lockable Rackmount Drawer is available that slides out a full 9.5" (241 mm). If you have any questions about this product by RACKSOLUTIONS, contact us by completing and submitting the form below. If you are looking for a specif part number, please include it with your message.